The Progressive Catholic Voice: "Our Voices Are Growing"
Mary Beth Stein (pictured above, second from left) was one of approximately 50 church reform representatives who gathered in Rome in the days leading up to the Vatican's recent Synod of the Family. 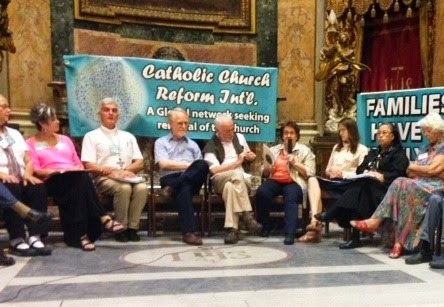 This gathering of church reform representatives was entitled the Forum on the Family and was organized by Catholic Church Reform International. Upon her return to the Twin Cities and her work with both the Catholic Coalition for Church Reform and the Council of the Baptized, Mary Beth shared her thoughts on the Forum on the Family with The Progressive Catholic. Gathered together at the Forum on the Family were people from all around the world. We all came with different levels and forms of involvement in Church reform. Some represented reform groups, both large and small, with varying histories of action and organization. Others were individuals who care deeply about the direction that our Church is taking in its teaching and ministry to families of all kinds. One young man is a PhD student working on his dissertation about reform groups within the Catholic Church. All of us came together in hope for our Church. We expressed hopes for the Synod – hope that the bishops will hear our voices and honor our lived experiences as we live out our faith from within our families and in the world. But whether or not the bishops choose to hear us, we all came away from the Forum on the Family knowing that our experiences and concerns are echoed around the world. We are not alone. People across the continents are daring to stand up as Catholics empowered by our baptism to speak out for our faith. We came away from the forum with new worldwide connections, united in our love for the Church and concern for its ministry, and knowing that the Spirit is uniting us and calling us to speak the truth as we know it. My greatest blessings in attending this forum came from meeting and joining with people from around the world and standing in solidarity with them as we all work to bring about a Church more faithful to the compassion of the Gospel. We are united and our voices are growing. Catholic Church Reform's Alternate Gathering on the Family Highlights Lay Vocation – Joan Chittister (National Catholic Reporter, October 2, 2014). • Let Our Voices Be Heard!